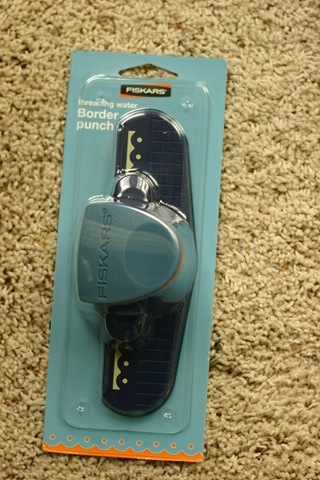 I got the fiskars threading water punch today on a quick trip to Target, the 2nd day in a row that I visited Target? Seems I'm always forgetting something when I go shopping so we were just running in to grab a couple things. Quickly I snuck down the scrap book isle and there it was... only one though because believe me if there was more, I would have gotten them! I wanted to get a picture of the yard being it was the first grass cutting of the season and I love how the yard looks when its first done, however I had a last minute rush to the dentist since my temporary crown came out and I had to have it repaired. Which also meant I couldn't go to the mandatory meeting at the high school for Chelsea's New York trip, so dad had to fill in there. I finished reading Scratch beginnings and it was very good. I read it in 3 days so that alone has to say something. Thanks Aimeslee for that recommendation. Now I'm trying to decide which of the six other books I'm currently reading to try and finish up next? Still working on that 100 in 08?? ?